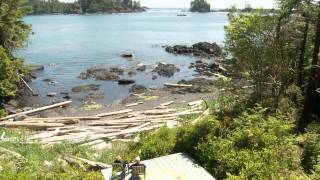 Located in the small fishing village of Ucluelet just south of Tofino on the west coast of Vancouver Island this luxury oceanfront bed & breakfast is the perfect romantic retreat. Here you will create memories that will last a lifetime. Ideally situated on the Wild Pacific Trail, A Snug Harbour Inn is also conveniently close to the Pacific Rim National Park and Long Beach, where you will find numerous hiking trails, secluded coves, many forms of wildlife and miles of beaches to explore. Situated in a simply awesome setting this luxury bed and breakfast sits perched on an 85 ft. cliff, surrounded by pristine old growth forest and set against some of the world’s most dramatic Pacific coastline. Built to be luxurious, romantic and very private, A Snug Harbour Inn caters to adult guests. All of our rooms include a king or queen size bed, down duvet, cozy robes, fireplace, private deck, jetted or soaker tub and ensuite bathroom with heated floors. Four of our six rooms have awesome ocean views, with the other two in a separate building that is surrounded by a majestic old growth forest. One of our forest view rooms is pet-friendly the other has been designed to be wheelchair accessible. All guests have access to the Great Room with its wall of windows, main deck with hot tub and our private beach with viewing deck. Vancouver Island, British Columbia is world famous for its great winter storm watching and there is no better place to watch these storms than at A Snug Harbour Inn. We are located in Ucluelet, just south of Tofino, Pacific Rim National Park and right on a cliff overlooking the rugged Pacific coastline. A truly amazing experience! A Snug Harbour Inn luxury bed and breakfast sits perched on an 85 ft. cliff, surrounded by pristine old growth forest and set against some of the world’s most dramatic Pacific coastline. The perfect home away from home. Ideally situated on the Wild Pacific Trail, A Snug Harbour Inn is also conveniently close to the Pacific Rim National Park and Long Beach, where you will find numerous hiking trails, secluded coves, many forms of wildlife and miles of beaches to explore.